Artist, James “Jay” Seaman, specializes in metal and wood sculptures; as an artist, he consistently hones his technique and perfects his methods. With his sculptures, Jay pushes the aesthetic envelope with his creation of forms. He strives to stretch these forms, while maintaining the strength of the materials and essential qualities. Jay Seaman’s technical knowledge comes from his 25+ years of experience in the fields of sculpting and woodworking. He possesses a Bachelor’s degree in psychology, but as an artist is largely self-taught, relying on experimentation and his consultation with other fine artists and craftspeople. Seaman’s sculptures have been installed far and wide, throughout his home state, New York, to Florida and Texas, and world wide, in India and Ireland. The sculpture in India is of a man crossing the finish line, installed at a school. 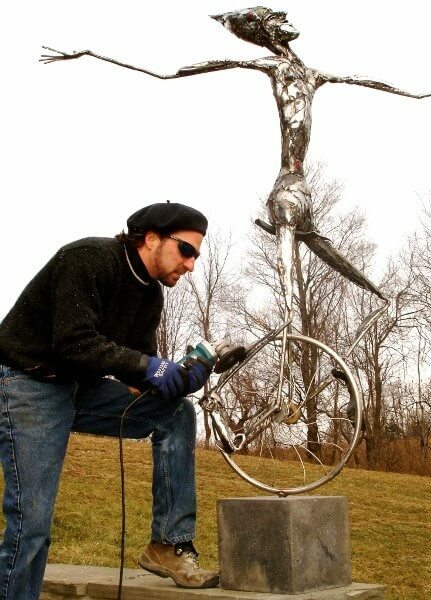 From whimsical to monumental, Seaman’s metal sculptures can be found in museums, public-art settings, real-estate developments, and in private collections. Notable highlights of Jay Seaman’s work can be seen at Cornell University, and at the Montezuma National Wildlife Refuge. Jay’s impressive woodworking skill is demonstrated with his elaborately carved mahogany mantel, at Cornell’s restored Sage Hall. In 2016, Jay Seaman was commissioned by the U.S. Fish and Wildlife Service to commemorate its eagle restoration program, and Jay welcomed the challenge in creating the stainless-steel eagle. The U.S. Fish and Wildlife Service has unveiled the new bald eagle statue at the Montezuma National Wildlife Refuge. The eagle’s wing span is 21 feet and was erected to commemorate the 40th anniversary of the bald eagle restoration program. Jay Seaman also sculpts whimsical sculptures of people, animals and insects See Gallery of Jay Seaman’s sculptures. Recent collaborations have also included Corning Museum of Glass. Jay welcomes future collaborations and commissions.